Would you like to be much closer to nature or enjoy gardening and want to irrigate your plants in backyard? 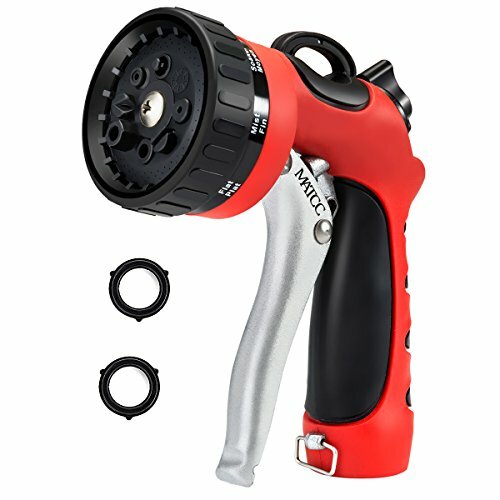 Maybe you are looking for a car wash sprayer or want to give a gift to your parents who love gardening. MATCC Garden Hose Spray Nozzle will be your good choice. 1.Fits All Standard Garden Hoses: 3/4" solid brass connectors with On/Off valve. 2.Front Pull Trigger With Labor-Saving Clip: The front pull trigger will be much more natural in the hand and easier to use. 3.Sturdy and durable: Durable zinc alloy construction prevent from rusting, with sealing rings to prevent from leaking which can increase the service time. 4.Soft Rubber outer coating is slip-resistant and comfortable. Please feel free to email us if any displeasure, we will try our best to solve it until you are satisfied. Don't hesitate anymore, just ADD IT TO CART and enjoy your green life. ☘Heavy Duty Spray Nozzle: Durable zinc alloy construction for durable use and prevent from rusting, much stronger than plastic water nozzles. Rubberized outer coating is slip-resistant and comfortable. ☘Comfortable Watering: Special lock bar to keep the water flowing and labor-saving, just use the clip so you don't have to keep your hand holding it the whole time. Soft rubber coating makes it very comfortable when use. ☘Unique Easy storage Design: You can hang it on the wall or hook up when it is not in use. unique suspension loop for easy storage. ☘No Leaking: 3/4" solid brass connectors with On/Off valve to adjust water flow and fits all standard garden hose. 2 rubber sealing rings included to prevent from leaking on connector. ☘8 Patterns Metal Garden Hose Nozzle Sprayer: Jet, Angled, Shower, Full, Flat, Mist, Soaker, Cone. More choice for irrigating plants, cleaning garden or pool, dog bathing, car wash. Email us if any displeasure, we will try our best to serve you.